Waxing vs shaving; Which One Is Better and Why? this is an age old debate that has seen no winner! Waxing is somewhat painful while shaving on the other hand is slightly risky, but rather painless. Many women do not mind the nicks and cuts that are part and parcel of shaving. Yes, shaving is painless, less messy, and certainly less expensive. That being said, waxing has myriad benefits over shaving in the long run. Read on to more on waxing, shaving, and yes which is better and why! Also read: How to Get Rid of Razor Bumps? Waxing, it’s a term with which everyone is familiar with. So is shaving. While waxing your hands and feet at a salon is the best bet, you can try it at home too. Your first try may be terrifying and you might find it hard to get yourself to rip your own hair off. But, with time, you will master the technique and find it a lot easier to do. So, how do you wax your hair at home? Do not wait until your legs begin to look ghastly. The hi-tech wax formulas available today can pick up hair as short as two millimeters! The very first step to a clean and smooth waxing session is to prep your skin properly. Exfoliate your skin at least 24 hours before you plan to wax, or you may have to deal with skin irritation. You can use a loofah or scrub to slough off that layer of dead skin. This will help the wax you use, to grip the hair better. Once you are ready to go, wash your legs and hands with a gentle soap and a splash of water. Pat dry and allow it to dry thoroughly. Now, you are ready to do the thing! Apply the wax of your choice in the same direction as hair growth, then place a wax strip on top. Use a little pressure and press the strip down firmly. Now here comes the tricky part! You have to hold your skin really taut with one hand, and use the other to pull the strip off in the opposite direction of hair growth. You will have to ensure that you pull across as close as possible to the skin and not away from it. Once you have managed to remove the strip, apply a little pressure in order to ease and alleviate any pain or discomfort. If you are tackling a difficult patch of skin, like your underarms, get the help of a friend to do wax. Do not forget to pamper your skin after a waxing session. While experts suggest azulene oil, as it arrests irritation and redness, you may also apply some aloe gel to soothe the redness. Shaving, on the other hand is a pretty painless technique of hair removal. Simply lather your skin with soap or a shaving cream suitable for your skin type and shave the area with a clean, sterile razor. However, nicks and cuts go hand in hand with shaving. And, regular shaving can darken the area by several shades. This is why you will find your underarms much darker than the other parts of your body, especially if you shave them regularly! 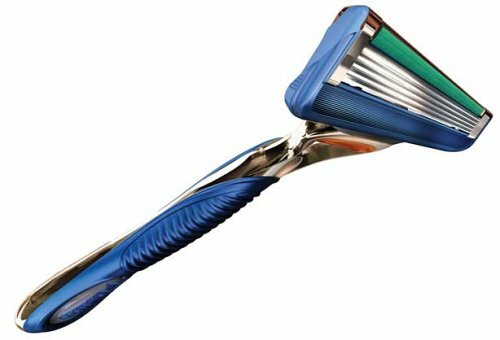 There are several razors on the market made especially for women. They glide on the skin, without cutting your skin. However, unlike waxing, the regrowth of hair is rather quick and also stubbly. It is obvious from the above discussion that waxing is much better than shaving. No wonder women across the globe, opt for this method of hair removal. Let us dig up deep into it and discuss more about the advantages of waxing over shaving. When you wax your legs and hands, not only do get rid of unwanted hair, but you will also exfoliate the skin. The wax helps slough away dead skin cells, revealing soft and smooth skin in barely minutes. We all know how important it is to exfoliate regularly, and yet many of us simply do not have the time to do so. While some women do exfoliate their face, the hands and legs are often neglected. When you wax your hands and legs, you will also be getting rid of dead cells from different parts of your body. This will make your skin look and feel more beautiful and pampered. The process of hair removal from awkward places can get tricky when you try out other means. For instance, when you have to run a razor past your underarms or bikini line, you have to be very careful. A slight change in the razor angle may lead to unwanted cuts. So it’s easier to opt for waxing that ensures better, quicker and safer hair removal. And that guys, was #Reason2 why you should go for waxing when it comes to waxing vs shaving. Also read : How to Get Rid of Ingrown Hairs? You can get your hands and legs waxed at a parlor and salon or even at home. Even the smallest of parlors today offer waxing facilities. Waxing can be done in two ways, either the usual way wherein you apply molten wax or by using ready-made wax strips. So, what is a wax strip? Wax strips are a boon to women all over the world! It is a very convenient method for all those who can’t visit a salon on a regular basis. All you have to do is take the strip, apply it to the area to be waxed and pull it off. Voila, your legs and feet are rid of hair! The best part is that wax strips are available at most departmental stores. #Reason3 why you should go for waxing in waxing vs shaving! This is perhaps the Numero Uno reason why most women prefer waxing over shaving. Shaving calls for cuts and nicks, and requires a great deal of precision and control over the razor. An unwanted and untimely cut on your neck or some other visible body part can be a real dampener. Besides, a cut in sensitive areas such as the groin can lead to excruciating pain, discomfort and also infections. On the other hand, waxing is proven to be way safer than shaving. Yes, you may feel pain when your hairs are pulled out, but it is only momentary as it usually vanishes within a day. #Reason4 why you should go for waxing in waxing vs shaving. Not sure if you should choose between waxing vs shaving? We suggest you go in for waxing. When you wax a particular part of your body, the hair gets ruthlessly uprooted. So it takes quite some time for hair to regrow in that region, thus making waxing long lasting. #Reason5 why you should go for waxing in waxing vs shaving. Must read : How to Get Rid of Vaginal Odor? Do you remember the first time you got your eyebrows plucked? That brings back some not so pleasant memories, does it not? The same is the case with waxing. For the first time, it may hurt really bad, and you may vow to never step into a salon again. But, in the long run, you will get used to the pain. #Reason6 why you should go for waxing in waxing vs shaving. When you wax a particular region repeatedly, over time the hair growth in the region reduces. This is because the hair follicles in the area gets damaged. So the hair that comes out is less healthy and comparatively thinner because it’s roots are weakened. 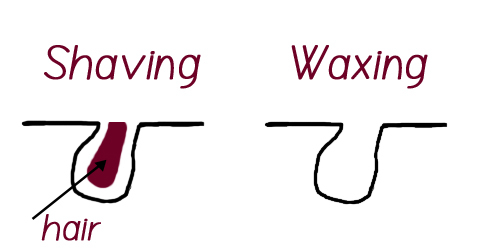 So, if you wax regularly, you will see less hair growth in the region, which could be a huge plus! So, no more having to run to the salon every 15 days! #Reason7 why you should go for waxing in waxing vs shaving. Waxing vs shaving? Which is better? If you are looking for smoother skin? Waxing gets a point! When your skin is waxed the dead skin cells in the area are also exfoliated. This means your skin is softer to touch and feel. Hi-tech waxes also contain moisturizing lotion which leaves your skin baby soft. Bid goodbye to dry skin, and welcome soft and smooth skin with waxing! #Reason8 why you should go for waxing in waxing vs shaving. From the picture above, you should be able to see the difference between waxing and shaving. Shaving, like we have already discussed, makes the regrowth thicker! You will also notice your hair growing back almost from the very next day! This means you will need to shave your legs and hands, almost every three days. On the other hand, during waxing, the force with which the hair is pulled out is immense, so it actually ruptures the hair follicle. Thus, when the hair regrows it’s less healthier and takes time to grow back. #Reason9 why you should go for waxing in waxing vs shaving. Just about every woman hopes that she does not have to deal with hair in the groin! If you are looking for a simple yet effective way to get rid of hair in the groin region? Waxing is hands down the best way to get rid of unwanted hair around the groin. Since waxing ruptures the hair follicle. Like we already have discussed an umpteen number of times, the hair that regrows after waxing, is thinner and takes longer to resurface. #Reason10 why you should go for waxing in waxing vs shaving. Pick the right wax. If you have sensitive skin, pick a wax that is clinically tested or simply go with an aloe based variant. Exfoliate before you wax as it softens the hair and also opens up the hair follicles, making the whole process a lot less painful. Make sure your hair length is between 1/4 and 3/4 inch in length for best results. Pop in a painkiller about half an hour before waxing, if your pain threshold is low. You can also use a numbing cream on the area you will be waxing. Do not apply moisturizers or use a deo the day you plan to wax. Oil or moisture will impede the wax from sticking to the hair. Heat the wax to the right temperature. If it is too cold, it will not spread. And, if it is too hot it will scald your skin. Apply wax on the right direction. Grit your teeth and rip off. Wipe the area clean with cold water. Hot water will only hurt! Do not keep going over the same patch. Use a tweezer to get rid of stubborn hair. Put your soothing lotion in the refrigerator the day before and use after waxing. It will calm your skin. Alternatively, you can also try a cold compress. Avoid tight clothing, exposure to sunlight, and scented lotions soon after waxing. Avoid waxing just before or during your menses as you will be super sensitive during that time of the month. Do not sit upright while getting your eyebrows waxed. If you are waxing at home, have something to distract you. This could be soothing music in the background while you wax. Do not apply hot wax to your bikini area. Must read: How to Get Thicker Hair Naturally? That should answer all your doubts on whether you should be Waxing or Shaving! If you have further doubts, tips or suggestions, we warmly welcome you to share them with us here in HNBT. Thank you! Waxing removes dead cells as well as hair, so that’s nice. I’ve never tried waxing before, but it sounds like it would make my skin look healthier if the dead skin was removed like that. It would be nice to not cut myself anymore. I get waxed before some of my bodybuilding competitions and I personally enjoy it. I like that you mentioned removing dead skin cells. My skin always feels great after a waxing. I’ve never been into waxing before, but I really like the idea that it removes dead cells. I also really like the idea that waxing won’t cause me to cut myself, which I tend to do every time I use a new razor. However, do you know whether or not the benefits of waxing are better when done with certain types of wax? 1. Waxing removes dead cells: Shaving does that too, it’s used as an exfoliator, though sometiemes, many talk about pre exfoliating to prevent ingrown hair. 2.2. “It is Faster: When it comes to removing hair in awkward places, it’s simple to wax. In such places when you have to run than razor you have to be very careful. A slight change in the razor angle may lead to unwanted cut.” Well that might be true for pubic hair, though it still depends on preference, but otherwise shaving is the typically faster way and usually with the right razor it’s quite difficult to cut, unless you move it sideways :). You can get quite fast with waxing too, though, I agree. 3. Available everywhere: Waxing can be done in homes as well as in parlors. Plus if you wanna take some off you chin and eyebrows, these razors might resemble mascara wands, hence less embarrassment. Kidding here. 4. You wont cut yourself with pieces of metal: Both shaving and waxing might expose your skin without due prepping and aftercare. If you shave, you should wet your skin properly, not excessively with warm water, moisturize, then be very gentle with the blade, proper pressure, etc. Waxing might cut some capillars for every hair pulled off, not the end of the world, but that also needs some after care, just like shaving (:. 8. Smoother skin: “This is another point on which the debate of waxing vs shaving where waxing gets a point. 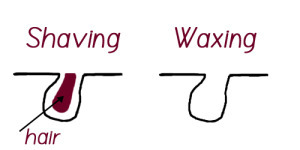 When a skin is waxed then it rips off the hair along with a layer of dead cells” As seen shaving also does, plus waxing might not tale all hair off and a whole layer has to regrow a bit before waxing again, while one can shave at any length, though it might be irritating done too often without the right precautions. Yeah, that’s indeed an advantage, although it’s impossible to tell the hair got a bit thicker and uglier if it’s regularly shaved, because the skin would still look and feel smooth anyway :). If you grow dark and thick hair to start with and you don’t like or find it ugly (does not mean that it is -_^), shaving is worth it and you might consider it. Think twice if your hair is instead very blonde and fine, it might be a pity. Hi Anto, thanks for sharing these amazing facts with us! Hi again! Glad of the appreciation, I was afraid of having been too lengthy, actually :). I “come out”, I’m a male, but still I like to keep myself groomed and last summer I started shaving on a few zones of my body. Not that I have much hair for a guy and I still keep most of it, for now, it’s mainly to trim and to take care of it, especially in zones where I think it doesn’t look good. I’m comfortable with shaving, so are some women I know and of course they typically do way more extended zones. That said I definitely see how one might prefer waxing, it last heaps longer and that’s great if you are not comfy with having to depilate often, although I and other people have no problem with it (well, most of the time, at least ^_^) and that hair might thin with time as well as I can understand enjoying taking hair off quick and hassle free and at any lengths. It’s really a matter of personal preference, some are less uncomfy with a bit of pain and then not thinking about it for weeks, others I think, don’t mind having to shave regularly and a bit more often with time and becomes almost second nature under the shower, also getting done both more gentle and quick with experience. Fun fact, it’s a myth it grows faster, most of the time, as most of hair is at full length, before shaving, it doesn’t need to grow. A part of it is recently shed and it’s likely growing mostly as fast as shaven one, but it’s difficult to notice among so many full grown ones :). When you shave instead you notice most hair growing back from scratch to reach its full length. Sorry for being lengthy again, can.I still ask a question? Does the thicker shaved hair eventually returns normal with time after you stop or is it permanent to an extent? Not that it’d matter much to me, for the reasons mentioned before, I’d have started anyway. But for people who are considering to start, it’s good to know what to expect long term 😉 especially if one doesn’t plan to keep up from then orif you (or I), plan shaving new zones of the body. Thanks so much, you’ve been vert kind, sorry again for the length and nice to meet you. Hi Anto, welcome back! You sure have your point, and thanks for sharing it with us. We hope our readers will be able to weigh the pros and cons of both the methods and resort to the method they think suits them the best nonetheless. Thanks again to you for the reply. I think you are right, most dermatologist confirm that but it’s curious how some of them or some aesthetician say otherwise, like this Jody Levine I cited, but I found that everywhere else she also confirms it doesn’t actually get thicker and it’s an impression, wonder why she said that in the article (:, that’s why I like to listen to different opinions and argument, maybe from experience, to determine if it’s true or from misconceptions. Yeah I think it’s cause hair, especially body hair, if it can reach its final length, keeps it until shed or cut, hair also does but very few people make it reach that length, for obvious reasons, from practical to stylish :). The base of an unshaved hair is always thicker and not only by shaving we eliminte this tip which gets lost, but it will make this shaft grow from that point for the remainder of its cicle (which is longer than the time needed to fully grow, of course), so when at full length again, it will be fully made of what used to be it’s thickest part, which is now it’s thinner one and so on with the progressive shaving of the thinnest zone, though at one point the difference is minimal. This is probably what makes it seems thicker, but it’s very unlikely that when the hair finally sheds and grows back from scratch will be actually thicker, there’s no biological reason for it, I think correct me if I wrong. What’s curious is rather how it grows back exactly to its old length then stops again, at least until its whole cycle, which is unaffected by cutting and styling in itself, comes to an end. But you also still say that it makes the regrowth thicker, in the 9th point 😉 while you correctly stated now it’s maybe not exact, it’s no problem, mind it, just to remind. As you corrected before, the consideration it makes hair healthier too. Though it might be technically correct that the regrowth is thicker, as a temporary, not permanent effect. So there are much lighter consquence for starting to shave new zones of one’s body, yeah you have to leave through thicker regrowth for a while, but not permanently ;). Perfectly correct, though, if you hate that and shaving often you might consider stronger methods. Peace and I wish you well and other informative articles :). Hey, how’s going? It has been nice to discuss with you and you even thanked me, for my modest info in my first contribution. Yet I still just want to know if the shaved hair remains thicker forever, after we stop shaving. And is waxing gonna hurt more? This is what she suggest to who prefers shaving, which includes herself, btw. “Get the most out of your shave: Moisturizing is the best thing you can do after you shave to prevent those annoying little red bumps, according to Dr.Levine. Venus recommends changing blades every five to 10 uses. The rule of thumb is: If you have to start pressing hard, it’s time for a fresh blade. ” personally, mine last even more, before they start cutting less, it doesn’t hurt or irritate more or let me uncomfortable, but they don’t make the skin as smooth, where I grow more hair, so I change the blade :). Have a nice day. Thanks anyway but your answer would be welcome, you’re very kind, sorry to bother you. Both me & my hubby use to shave down there, but now we both go & get waxed (Hollywood style) on a reg. basis. We both enjoy the look & feel of it on each other. It’s so much more pleasant than dealing with hair that get’s in the way, not too mention it makes his beautiful manhood look even longer who’s at 23 cm’s (9in.) Were just a couple of happy smoothies! 😉 No hair, Don’t care!